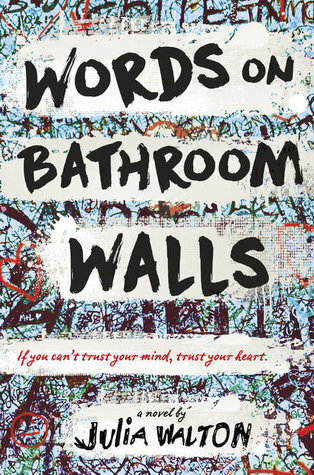 Thanks to Random House, we're pleased to take part in the book tour for Words on Bathroom Walls, a new contemporary YA novel by Julia Walton. Keep reading to check out our review! Words on Bathroom Walls is told via journal entries by Adam, a teenager recently diagnosed with schizophrenia. On one hand, the diagnosis helps because he can put a name to what he's been experiencing -- visions of people who aren't there, paranoid thoughts that aren't really his -- but on the other, now he has this label on him and he's afraid everyone's going to find out. The book opens with Adam switching schools after he has an incident at his old school. He's on a new medication now, one that helps him better manage his symptoms. With the new medication, he's very self aware of what his symptoms are, and is developing the coping skills to deal with his hallucinations when he has them. He still refuses to talk to his therapist though, so instead he writes down his thoughts and responses to the therapist's questions, which is what we're reading. I liked Adam as a character. His voice felt very natural and engaging, full of all of the regular fears and anxieties of teenagers, with the added complexity of mental health issues on top of that. He tries his hardest to appear neurotypical, because he doesn't want anyone to know his secret and be afraid of him. He puts up a bit of a "whatever, who cares" kind of attitude in his journal entries, so the times where he admits his fears or concerns, particularly in an entry that takes place at the same time of the real-world Sandy Hook shooting, feel even more shockingly vulnerable. I enjoyed the supporting cast of characters and thought that they had surprising depth, particularly Adam's mom and step-dad. I wish we could have gotten a bit more around Ian, the rich kid bully who targets Adam, particularly his motivations, but overall I liked the world that the author created. The pacing of the book really worked for me -- once I got through the first few chapters, it was very quick reading, and the journal entry format makes it easy to read several chapters at a time and still have an easy stopping point, if you're not going to read the whole book in one go. I can't speak to how much research the author did in regards to talking to people living with schizophrenia. The end notes talk a lot about work she did to understand treatment. Most of my knowledge of schizophrenia is from an academic standpoint, so while I can give you the DSM criteria for it, that's different than being intimately familiar with the way that symptoms manifest. I worry a bit that Walton's take on Adam's symptoms, actions, and self-awareness here seems a bit simplistic, or a bit too "Hollywood". I do know that I would be interested in reading this book from an own voices author, that is, written by someone who is schizophrenic. It could make for a more compelling, even harrowing, read, if the text felt just a bit more authentic. Glad that you seemed to really enjoy this one too. I read this one and absolutely loved it. The more I thought about it after I was done, the more I loved it. I loved the way the author wrote it through journal entries because it gave a little insight into what he was thinking and feeling. Great review! I agree with you on the ownvoices part. My mother's soon to be ex-husband is in the schizophrenia spectrum with varies diagnosis throughout his treatment. I won't be reading this because of that, looking on the outside is SO different and none of the people I've met said good things about the way the media portrays them. I just can't read something about their illness without more assurances of the authenticity.